4 Bedroom Detached House For Sale in Bedford for Asking Price £400,000. A well presented and extended four bedroom detached home located in a cul de sac position within the popular Riverfield Drive area of Bedford. The property benefits from double glazing, gas to radiator heating and a 28ft uPVC conservatory with bi folding doors to a landscaped rear garden. There is a separate lounge, and a refitted open plan kitchen/dining area. There is a downstairs cloakroom and separate utility room. 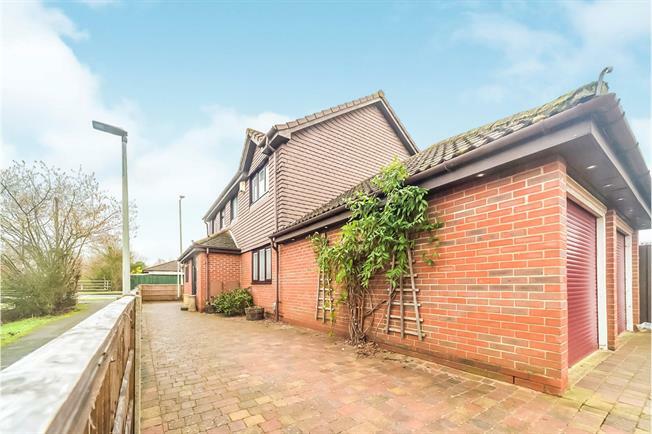 Upstairs there is a refitted en suite to the master bedroom and a refitted family bathroom and a double garage and driveway which provides off road parking for numerous vehicles. Radiator. Door to entry hall. Radiator. Stairs to first floor. Double glazed uPVC window with obscure glass facing the front. Radiator. Low level WC, pedestal sink. Double glazed uPVC window facing the rear. Radiator. Roll edge work surface, built-in units, one and a half bowl sink. UPVC double glazed door. Heated towel rail. Roll edge work surface, built-in units, single sink. UPVC bi-fold double glazed door. Double glazed uPVC window facing the rear. Electric heater. Double glazed uPVC window with obscure glass facing the front. Double glazed uPVC window with obscure glass facing the front. Heated towel rail. Low level WC, corner shower, wall-mounted sink. Double glazed uPVC window with obscure glass facing the front. Heated towel rail. Low level WC, panelled bath, wash hand basin. Raised decking leading to a laid to lawn area. Side storage area. Pond. Wall and sunken lights. Off road parking for numerous vehicles leading to a double garage. Path to front door.